Hair Plus eyelash enhancing serum comes in a nice, aesthetic bottle of soft, elegant colours (black combined with white and red print). It is hidden in a black and quite large box which also contains a leaflet with the application method, the list of contraindications and possible allergic reactions. Thanks to a solid bottle and top, the serum won’t spill out. The brush is small and very flexible. You must learn how to apply the product if you want to enjoy nourished eyelashes. 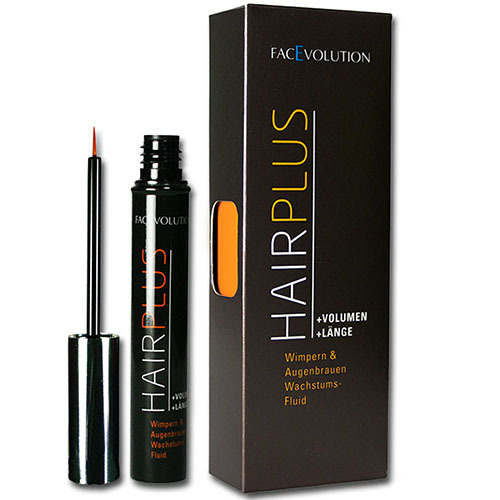 The capacity of Hair Plus eyelash enhancing serum is 3 ml. It is a product that helps to regenerate the lashes after summer or chlorinated water. After the completed treatment, the eyelashes stop falling out whereas the bulbs are strengthened. You will also see subtle darkening effect. Hair Plus eyelash enhancing serum delivers an array of vitamins that are necessary for strong lashes. Hair Plus serum is applied the same way that other eyelash serums. You use a small eyeliner-like brush to spread the product along the lashline. The serum must be applied to dry and clean eyelids after removing impurities and make-up. The downside of Hair Plus eyelash enhancing serum is its brush that has very few hairs. As a result, the serum drips off the brush before you manage to apply it to the lashline.